If you live in the Milwaukee, Wisconsin area, we have some exciting news! The Wisconsin Firearms Coalition will be coming to the Milwaukee Gun Show February 10th (Friday) and February 11th (Saturday). The show is being held at the Milwaukee County Sports Complex, which is located at 6000 West Ryan Road in Franklin, Wisconsin. 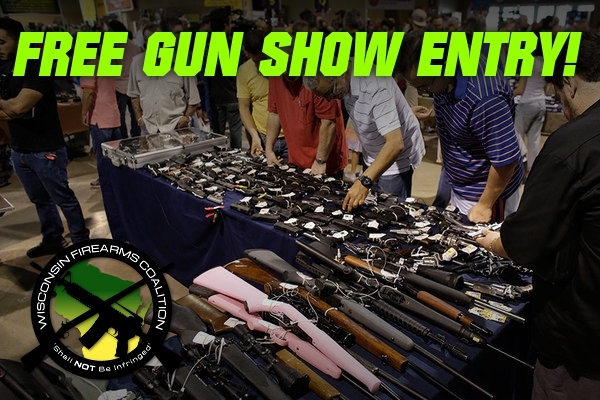 This is the largest gun show in Wisconsin — put on by the Bob and Rocco Gun Show Team — and it’s always well stocked with guns, ammo, gear and more. I hope you’ll stop by and get involved in our effort to stop Representative Chris Taylor (Democrat-Assembly District 76) and her attempt to push gun control here in Wisconsin. Our political insiders told us just last week that Rep. Taylor is attempting to re-institute the 48-Hour waiting period to buy a handgun for self-defense. This is the same anti-gun waiting period that was finally removed from Wisconsin law back in 2015. The archaic law doesn’t stop criminals and only hurts law abiding citizens. Rep. Taylor knows that the bill stands little chance of passing, but is trying to test gun owners determination in stopping anti-gun legislation! Despite Donald Trump winning the Presidency, and anti-gun legislators being defeated across the country, we must remain vigilant in protecting current pro-gun laws and defeating anti-gun legislation. That’s why we go to these great gun shows, to mobilize as many gun owners as possible to sign their petition in support of Constitutional Carry, and to stop anti-gun legislators like Rep. Chris Taylor. That’s why we hope to see you at the gun show this weekend. While you’re there, you can join the Wisconsin Firearms Coalition and pick up a free T-Shirt and a free decal! Joining the Wisconsin Firearms Coalition is a great way to show Rep. Taylor you aren’t asleep when it comes to fighting for gun rights. You are wide awake and fighting back! In addition, if you’d like to volunteer during this show for a 4-hour time slot, the Wisconsin Firearms Coalition will pay your admission to the show and give you a free WIFC T-Shirt! P.S. The Wisconsin Firearms Coalition will be at the Milwaukee Gun Show this weekend, on Friday and Saturday! Come on out and get involved in our fight against Rep. Taylor’s gun control scheme here in Wisconsin! While you’re there, don’t forget to sign the petition to stop Rep. Taylor’s mandatory 48-Hour Waiting Period for a handgun bill! Gun Control Legislation About to be Filed in Madison!